More than three in four Trump voters (77%) support generating renewable energy (solar and wind) on public land in the U.S. However, a majority also support drilling and mining for fossil fuels on public land (72%). Seven in ten support funding more research into clean energy (71%) and providing tax rebates to people who purchase energy efficient vehicles and solar panels (69%). 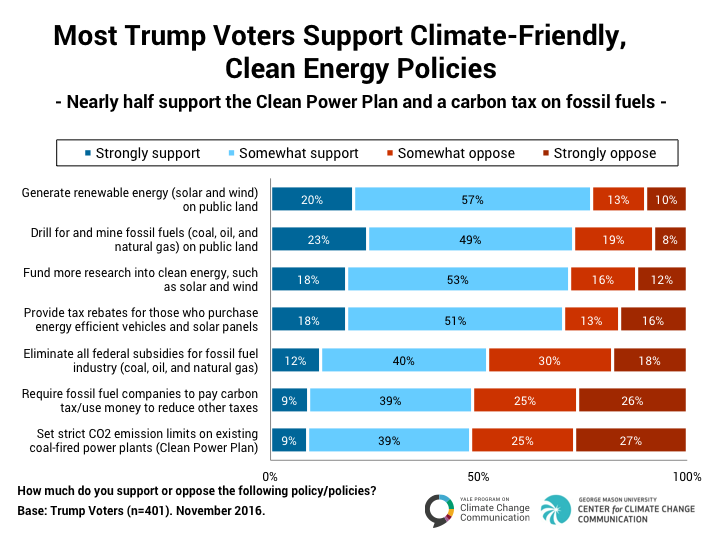 Over half of Trump voters (52%) support eliminating all federal subsidies for the fossil fuel industry, and nearly half (48%) support requiring fossil fuel companies to pay a carbon tax and using the money to reduce other taxes by an equal amount – a plan often referred to as a “revenue neutral carbon tax.” Finally, almost half (48%) support setting strict carbon dioxide emissons limits on existing coal-fired power plants to reduce global warming and improve public health, even if the cost of electricity to consumers and companies would likely increase. This policy is the core of the EPA’s Clean Power Plan. 3.2. Half of Trump voters say transitioning from fossil fuels to clean energy will either improve economic growth or have no impact. 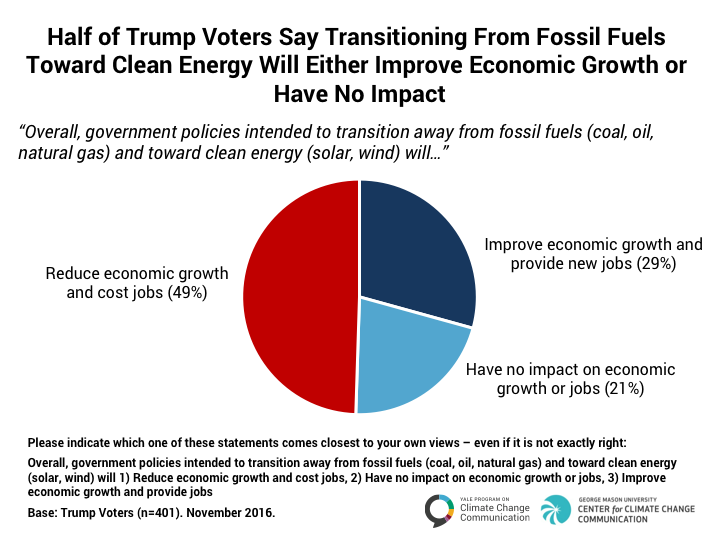 About half of the people who voted for President Trump think that government policies intended to transition away from fossil fuels and toward clean energy will either improve economic growth and provide new jobs (29%), or will have no impact on economic growth or jobs (21%). The other half (49%), however, think these policies will reduce economic growth and cost jobs. 3.3. Nearly three in four Trump voters say the U.S. should use renewable energy sources more. 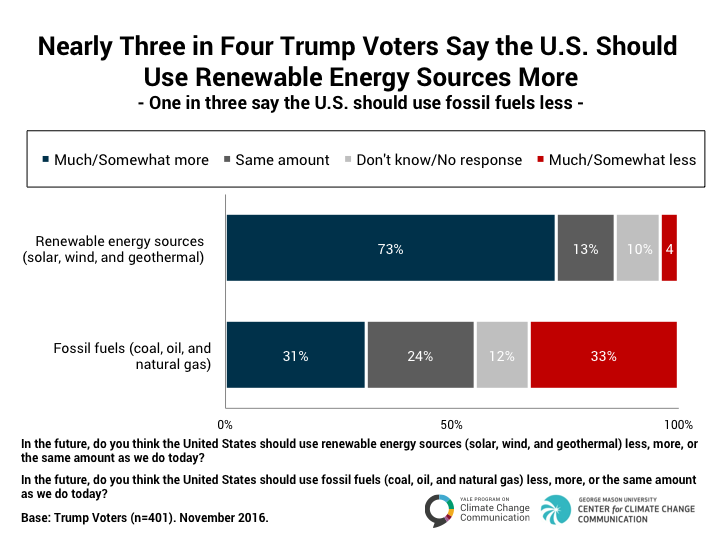 Almost three in four Trump voters (73%) say that, in the future, the U.S. should use more renewable energy sources (solar, wind, and geothermal). Additionally, one in three (33%) say that the U.S. should use fossil fuels less in the future, while nearly one in three (31%) would like the U.S. to use fossil fuels more. Leiserowitz, A., Maibach, E., Roser-Renouf, C., Cutler, M., & Rosenthal, S. (2017). Trump Voters & Global Warming. Yale University and George Mason University. New Haven, CT: Yale Program on Climate Change Communication.